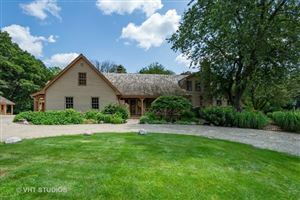 Fall in love w/this charming Cape Cod! Gorgeous hardwood floors, vaulted ceilings & white kitchen w/granite & stainless steel is a delight! Master bedroom w/luxurious updated spa bath that features glass shower & vessel tub! Three additional bedrooms & bonus on second floor w/dormer windows for that charming Cape Cod touch! Tucked away in a cul de sac w/360 degree views that can't be beat! Newer roof & mechanicals (furnace, water heater, water softener, reverse osmosis), freshly painted inside & out, new carpet, refinished hardwood floors & professional landscaping! Great open floor plan w/1st floor laundry & office! This is your place to be for all seasons - completely private backyard w/mature trees, wildlife & a 56' deck to enjoy the natural setting! Best of both worlds w/a private cul-de-sac location & Tower Lakes amenities: Fishing, skating & swimming in the private lake w/life guarded sand beach, tennis courts, playground/park + loads of year round activities. Barrington Schools!